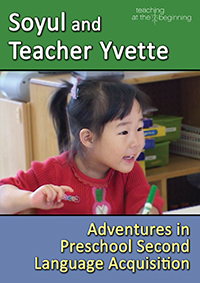 In 2008, Sally Durbin and Phil Bedel founded the nonprofit Teaching At The Beginning, Inc. On its behalf, they photographed, edited, and produced the DVD package, Soyul & Teacher Yvette: Adventures in Preschool Second Language Acquisition. They provide professional development sessions on dual language learning and have presented to numerous organizations, such as the National Association for the Education of Young Children, California Association for the Education of Young Children, California Association for Bilingual Education, and Teach for America. Sally Durbin is a National Board Certified Teacher and holds an Administrative Credential. She earned the Language Development Specialist (LDS) and the Bilingual Cross-Cultural Language and Academic Development (BCLAD) certificates from the state of California. For twenty years, she provided bilingual instruction to preschool dual language learners in the Los Angeles Unified School District. As an advocate of quality preschool, she created and delivered professional development sessions to National Board candidates at UCLA’s Center X; provided consultation to the Disney Educational Media Company; and campaigned for the groundbreaking First 5 California, now serving families throughout the state. She graduated with honors from UCLA, where she earned her teaching credential at the School of Education. In 2005, Sally Durbin and Phil Bedel produced the award-winning documentary Beating the Odds, advocating universal access to quality preschool. Their website, www.teachatb.org, provides short videos, current research, and hands-on ideas for all educators in the field of preschool dual language learning.